It seems that Johnny Manziel just will not go away. Instead of making headlines for his abilities on the football field, Manziel is once again showing us how capable he is at winning in life. The former Cleveland Browns’ QB, who was cut after numerous issues, is reportedly being sued over wrecking (allegedly) a house he was having a party at back in April. A Real Estate Agent, who had rented the home in the Hollywood Hills to Manziel, is claiming that the estranged football player totaled the home with extravagant, drug-induced parties. He now wants the money from Manziel to fix the rental. Nicholas Goodwin, the man behind the suit, says that he was initially approached by a man named “Travis” about renting the 5000 square foot space in April. Goodwin claims that he recognized him as Manziel. Travis Manziel told Goodwin that he would keep things low key and only needed to rent the home for two nights. He even said that he was prepared to pay a fine if more than 15 people came to the house at one time. Goodwin says that instead of all that, Manziel trashed the home. He left the property damaged and ruined, leaving behind a drug trail that would make Walter White and Jesse Pinkman jealous, not to mention the hazardous cleanup. Manziel even accomplished getting the cops to come out to the rental home. Damage was reported to items such as rugs, tables, couches, bathroom doors, and statues – just to name a few. Nicholas Goodwin wants the better part of 40K for repairs. 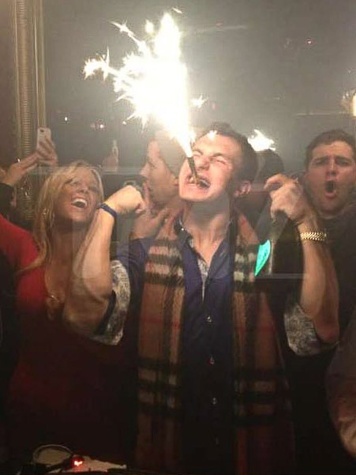 That should be no problem for Manziel, that’s just one game check for him, right? Uh, wait a minute. Niki Ghazian, an attorney who represents Nicholas Goodwin, told TMZ her client has filed suit in the Central District of the Los Angeles Superior Court. Manziel, who stayed at the home from April 4th to the 6th, is accused to breaking an agreement to pay a $10,000 fine if more than 15 people were at the $4.5 million home at one time and a promise that the home was to be used only for his personal and private use. Goodwin Group is the owner of L.A. Exotic Life, a luxury home rental agency. There were, she continued, “extensive burn marks from cigarettes and marijuana” found on the floor, wine stains “that cannot be removed” from a carpet, a broken glass table and a broken door.